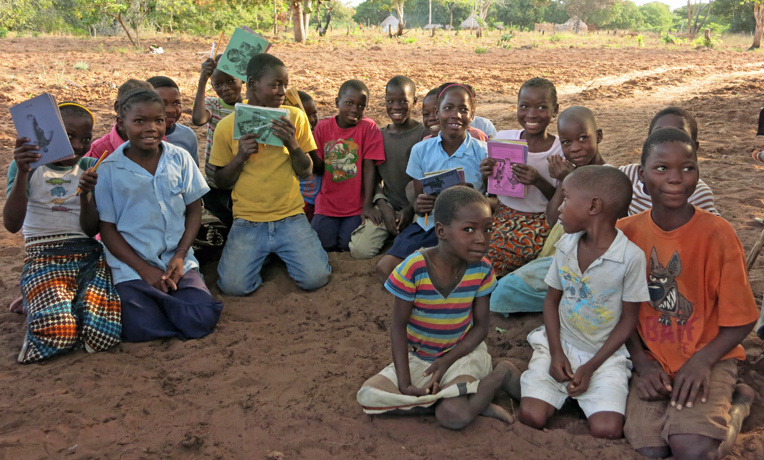 Proceeds from the chicken business provide school supplies for the children. Aresenio Olinda is excited and inquisitive, like most second-graders. But in other ways, his life isn’t like that of other 8-year-olds. His mother is dead, and he lives with his grandmother in a small village in Mozambique. His grandmother is poor and can’t support him on her own. The story of poverty is common among these people. But a Samaritan’s Purse livelihood program has brought hope to the village. Samaritan’s Purse staff members came to the community to implement a program for people caring for orphaned and/or vulnerable children. 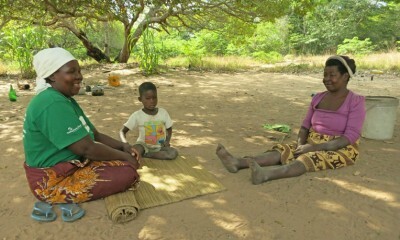 Adélia (left) visits with Arsenio and his grandmother. Adélia Fabião Botela became the leader of the new community group. With eight children to care for and no husband to provide an income, she has a full plate. “Here, we have problems with our children being sick, malaria, the lack of water,” she said. Through training provided by Samaritan’s Purse, the group was given the tools to begin a small business and invited to select a project. They decided to raise chickens, starting with the building and stocking of their own coop. The birds require only 30 to 35 days to grow from the small yellow fluff balls that swarm the feeders dangling in the chicken coop to mature birds that are ready for the market. The flock quickly grew, and the group currently has 200 chicks. 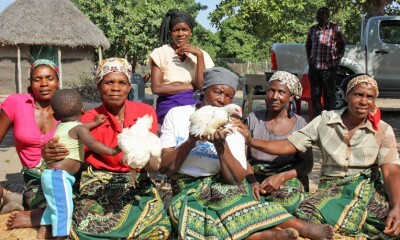 The chicken project is providing a means to care for orphans and widows. The group is encouraged to use the proceeds from the business to provide for all the children who don’t have parents. Aresenio’s grandmother tells about the help that she’s receiving from Adélia—soap, rice, sugar, school materials for the boy, and medical help when he gets sick. “I’m very thankful for the support,” she said. Through the help of the Samaritan’s Purse community group and their small business, 105 children like Aresenio are able to attend school. “Pure and undefiled religion before God and the Father is this: to visit orphans and widows in their trouble, and to keep oneself unspotted from the world” (James 1:27, NKJV).